This recipe is from the Virtual Museum of Canada / Museum of Civilization Sharing the Meal! virtual exhibit. The Meredith family (Rosedale, Quebec) recipe has been passed down through generations. Certain amounts, like the pottle of apples, are no longer in use. Every year, Christmas inevitably falls on December 25th. 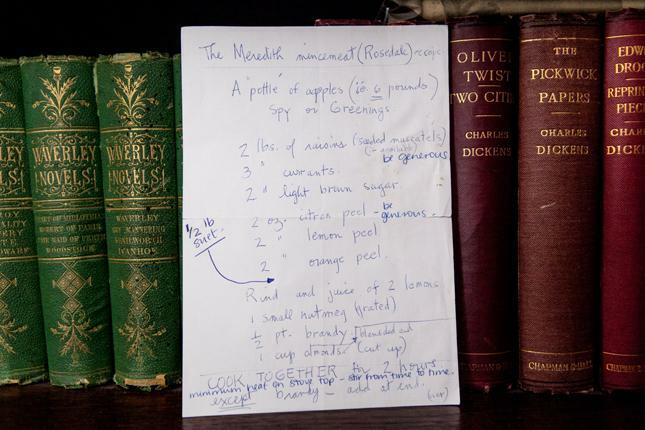 But for Helen Meredith and her cousin David Mendel, British tradition requires that certain dishes be prepared several weeks ahead of time. 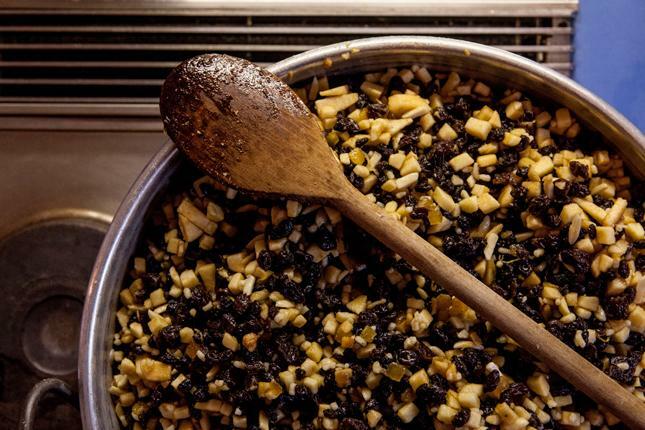 Making mincemeat—a savoury mix of fruits, nuts, spices and alcohol—is a family affair that involves several rituals. Friends and family members finely chop each of the ingredients that go into the mincemeat. Later, they’ll all enjoy delicious mincemeat pies together! Year after year, Helen Meredith devotes a great deal of effort to making mincemeat that is as authentic as possible. Some of the ingredients are difficult to find. In fact, she travels all the way to Ottawa for Northern Spy apples. She also uses the same pan her British grandmother used to make preserves. This typically British recipe is prepared for the holidays on stir-up Sunday, the last Sunday before Advent. Making mincemeat is a painstaking and lengthy process, so help is always welcome! Hear more of the mincemeat story at the exhibit! Cook together for 2 hours. Minimum heat on stove top, stir from time to time. Except brandy—add at the end.